You’ve asked for it and here it is! 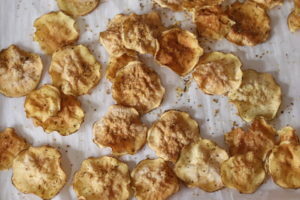 These baked sweet potato chips are a huge hit in my cooking classes. They are light, a great alternative to fried potatoes and are super tasty. I find the white sweet potatoes to be less sweet so I often use them, but any color sweet potato will do. And this time of the year, they make a great healthy alternative on to the unhealthy fare we tend to eat all day long on Super Bowl Sunday! 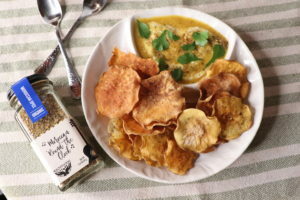 Serve these homemade yummy sweet potato chips with either fresh hummus or guacamole. You’d be surprised at how wonderful they taste and they are really, truly, Healthy On You! Just a little note: it may seem like a lot of potato slices at first, but through the dehydration process in the oven, the chips reduce in size significantly. Also, if the edges seem crispy and middle is still a little soft, remove them from the oven and let them rest for 10 minutes. This will allow them to fully crisp in the center. Preheat the over to 250°F. Using a mandoline slicer on the first notch setting for the thinnest whole slices, begin cutting the vegetables into rounds. Practice mandoline safety-use a no-cut glove on the hand you use to slice. If you don't have a mandoline slicer, you will need to use a very sharp knife, slicing the potatoes extremely thin and evenly. Spray each batch with olive oil, add the Moroccan Round the Clock spice blend and a pinch of salt. Evenly lay out each individual slice to fill the tray. Do not overlap. Bake for one hour and allow to cool and crisp for 10 minutes before serving.